That what I call a ceasefire a la UN! I therefore suggest to the UN Security Council a new resolution with a “new” UN observation team that will “protect and observe the first team of observers”. This represents a clear insult from the Assad regime toward the UN and international community, particularly as the targeting of this delegation took place on the same day that the UN Security Council took the decision to send more monitors to Syria! So after all of this, can we say that there is any expected benefit from sending international monitors to Syria? There can be no doubt that this is completely out of the question. Is this a joke? Must the FSA now also protect the international delegation of the “terrified” from the Assad forces? It is clear that the international delegation of the “terrified” will not accelerate or delay anything in Syria, particularly at their current level, therefore the Emir of Qatar was right when he said that the Annan initiative has only a 3 percent chance of success! And these UN observers WILL NOT “OBSERVE” on Fridays when most of the protests are! Another glorious example of this great UN “ceasefire”. “Col. Ahmed Himmiche, the Moroccan officer heading the advance team of United Nations observers in Syria, was quoted as telling reporters in Damascus that they would avoid Friday patrols, a statement that confirmed suspicions of many who have experienced the brunt of government oppression that the mission would be toothless. “We don’t want to be used as a tool for escalating the situation,” he said. Those remarks were met with some disbelief, particularly in Damascus, where antigovernment protesters said they faced arrest, bullets, tear gas and a wide deployment of government security forces trying to suppress their demonstrations — all violations of the supposed cease-fire plan. One point of the six-point peace plan negotiated under United Nations auspices is that Syrians be allowed to demonstrate freely. “I have no hope in the monitors; if they don’t tour on Fridays, why did they come to Syria?” said Yaser, 30, a protester in Jober, not far from downtown Damascus, where an attack by government thugs wounded demonstrators. “For us nothing is changed — we are demonstrating, the Assad forces are killing and the monitors are watching.” Demonstrators in Homs, which has endured more than two months of shelling, were more sarcastic. At the beginning of every video from a demonstration, someone off camera held up a piece of paper indicating the place and the date. One from Homs on Friday in Arabic and slightly mangled English read: “Dear Observer. We are waiting. Note: Homs is a city in Syria (can u come please?”). “Government forces’ continued shelling of the Syrian city of Homs has left some neighbourhoods unrecognisable. Satellite images taken this Mach reveal a deserted city centre, destroyed areas and heavy deployment of tanks across the city. “From division level down to battalions and brigades level. Entire units from commander down defy orders from the General Staff in Damascus to fight the rebels without crossing the lines to the opposition. To keep the spreading passive mutiny, Assad keeps the defiant units supplied in their barracks with funds and food. “The wretched plight of the troops manning Syrian defense divisions defending the Golan border and Mt.Hermon was clearly visible from lookout points on the Israeli side in the last two days. The regular water and food supplies to their bases, the backbone of Syria’s defense lines against Israel, were stopped and redirected to the units fighting anti-Assad rebels in other parts of the country. Large groups of armed soldiers have gone AWOL to hunt for food. For the first time in years, some have approached the border fence. They don’t ask Israeli soldiers for food, but parcels thrown across the fence vanish in a trice. The 5th Division posted in the Golan town of Quneitra has suffered the largest number of desertions, estimated at more than 1,500 officers and men, around 15 percent of the full complement. But hundreds of dropouts occur daily from the 15th, 9th and 7th Divisions stationed in central and southern Golan. “DAMASCUS // In the Alawite heartlands of Latakia and the mountainous rural hinterlands surrounding the city, the regime of President Bashar Al Assad still commands overwhelming support, buttressed by patronage networks and deeply entrenched fears of sectarian bloodshed. ”People are saying, ‘how long will we have to bear this’, more and more army families are wondering what they are sacrificing their children for, they are starting to say ‘where are the martyrs from the Assad family?’,” said an Alawite activist from Latakia, a once bustling port and tourist resort on Syria’s verdant Mediterranean coastline. Another influential Alawite opposition figure from a village in the Alawite mountains said dissent had become more pronounced since January, when an elderly Alawite widow buried her son, a soldier killed in the uprising. She had lost her husband and father in conflicts during the 1970s and 1980s under the former president Hafez Al Assad. Nonetheless even opposition figures in the region acknowledge most of Syria’s Alawites – members of the same obscure Shiite sect as Mr Al Assad and his ruling faction – continue to side with the regime. ”Ninety per cent of the Alawite community in Latakia and the villages support Assad, either because they have direct interests with the regime or because they are terrified,” said a leading Alawite dissident. ”The regime has convinced the minorities it is their protector and it has succeeded in neutralising the Alawites though fear, through linking their destiny to the regime’s,” said a Christian protester from Latakia city. ”For that reason, the majority [in Latakia] are not involved in the revolution, while they are in many other places, if you go to Hama you have no doubt the revolution will win, but in Latakia it is like a different world compared to the rest of Syria,” he said. Demonstrations, typically involving 100 to 150 young protesters and lasting up to 15 minutes, have stubbornly persisted in Latakia city, although they are confined to a few neighbourhoods and outlying villages, all where Sunnis are in the majority. To keep public protests at that low level, security forces have been deployed in strength throughout much of the city. Activists say it takes just minutes for dozens of security cars to arrive at the scene of any dissent. The Ramel neighbourhood, an impoverished Sunni ghetto that was assaulted by security units in August, remains sealed off by heavily fortified checkpoints. In the heart of Latakia, the school where Hafez Al Assad was educated has been shut down and garrisoned by the army, with hundreds of soldiers and plainclothes security officers on hand to prevent it – or the statue of the former president standing on a plinth outside – from being defaced by opposition activists. While the regime needs to hold Damascus and Aleppo if it is to remain in power, Latakia, as an unofficial capital for Syria‘s Alawites, is just as important. ”The regime hasn’t reached the point where it feels it is losing in Latakia yet, but it is not comfortable. It is working hard to keep the control it has,” said a local doctor who has been supporting protests. A protest organiser from the city, a 40-year-old engineer, said the opposition was similarly working hard to keep going under immense pressure, including widespread detentions and pervasive surveillance of activists. ”We were weakened by the arrests but we have reorganised and adapted,” he said. As with other parts of Syria, numerous activists in Latakia confirmed an increasing tendency among anti-regime groups to favour taking up weapons, and they reported growing activity by the Free Syrian Army, including raids made from rural areas into the heart of the city to help soldiers trying to defect. A protester from Ramel, a 23-year-old Sunni, said he would stop peaceful demonstrations and join the armed opposition if it were being supplied with weapons from the West or Arab states. ”In the beginning I used to say there was no way a civil war could happen here, that the Syrian people would not do that but after one year, we cannot keep saying the same thing. What we saw in Homs [sectarian violence] is a worry because we have the same mix of sects here in Latakia,” the Christian activist said. There is a lot to be said about the Arab League and what is has done or mostly not done in the region. 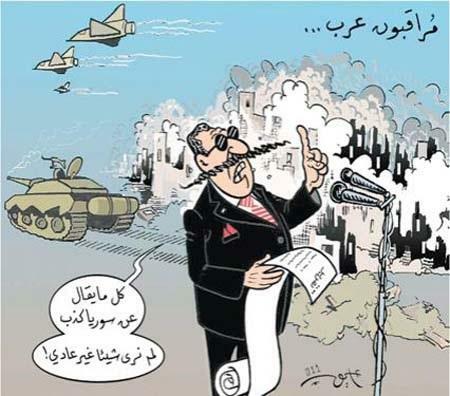 This post thou are about what the Arab League has done or not done regarding the civilian uprising inSyria. 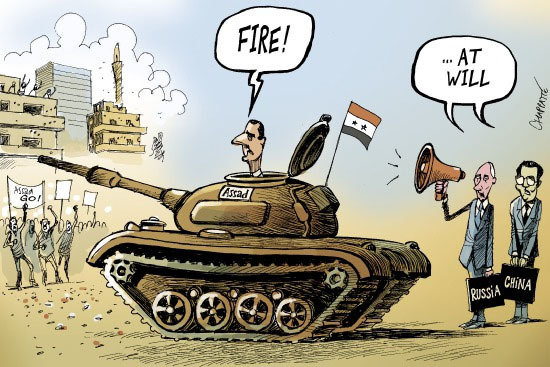 On November 3 2011, the Syrian government accepted an Arab League peace plan to halt its crackdown on protesters. The ceasefire quickly broke down, as government forces continued their suppression of protests. From 2 to12 November 2011, more than 250 people were killed. The peace plan – to allow foreign observers from the Arab League to monitor Syria’s progress in removing troops from protest areas, free political prisoners and negotiate with dissidents. On December 19, Syria agreed to the Arab League peace plan, agreeing to let observers into the country. On December 26, 67Arab League monitors arrive in Syria. On January 22 2012 Saudi Arabia withdraws from the Syrian observers mission. On January 24 Gulf Arab states announce that they are withdrawing from the Arab League’s observer mission in Syria. On January 28 The Arab League suspends the monitoring mission due to ”the critical deterioration of the situation” . “Reuters) – The Arab League suspended its monitoring mission in Syria on Saturday because of worsening violence, a move Damascus said was an attempt to draw foreign intervention as it struggles to quell a 10-month revolt against President Bashar al-Assad’s rule. The Arab League took the decision days after calling, unsuccessfully, for Assad to step down and make way for a government of national unity. It will take an Arab peace plan to the U.N. Security Council next week. On January 31, the Arab League asked the UN Security Council to adopt a resolution, based on the League’s action plan for Syria, including a call for Assad to step down. Yet, on February 4, the resolution was vetoed by China and Russia. Eventually, a non-binding resolution by the UN General Assembly was endorsed, with China and Russia voting against. The UN General Assembly resolution has no legal force, unlike the UN Security Council. So the as always very “helpful” Russians and Chinese even voted against a non-binding resolution by the UN General Assembly. Just to show who is in control. They could have abstained but they didn’t want to “risk” anything. So much for the Arab League peace plan. And who in their wisdom did the Arab League chose to lead the mission and obsevers in Syria? The Sudanese general Mustafa al-Dabi. “This has dismayed human rights groups, with Amnesty International warning that it could threaten the credibility of the entire mission. ”The Arab League’s decision to appoint as the head of the observer mission a Sudanese general on whose watch severe human rights violations were committed in Sudan risks undermining the League’s efforts so far and seriously calls into question the mission’s credibility,” it said in a statement. Gen Dabi served as head of the Sudanese directorate of military intelligence when Mr Bashir seized power in a coup in 1989 – a period marked by ”arbitrary arrest and detention, enforced disappearance and torture”, Amnesty says. Syrian opposition groups have also expressed concern about Gen Dabi’s strong military background. “(Reuters) – The choice of a Sudanese general to head an Arab League mission in Syria has alarmed opposition activists who say Sudan’s own defiance of a war crimes tribunal means the monitors probably won’t recommend strong action against Syria’s Bashar al-Assad. But some critics of Khartoum say it is all but impossible to imagine a Sudanese general ever recommending strong outside intervention, much less an international tribunal, to respond to human rights abuses in a fellow Arab state. Eric Reeves, a professor at Smith College in Massachusetts, who studies Sudan and has written strong criticisms of its government, said the choice of a Sudanese general was a sign the Arab League might not want its monitors to produce findings that would force it to take stronger action. ”There is a broader question of why you would pick someone to lead this investigation … when he is part of an army that is guilty of precisely the sort of crimes that are being investigated in Syria,” Reeves said. She said rebel leaders had accused Dabi of violations in Darfur, although Dabi was not one of the figures Human Rights Watch had linked to specific abuse documented in its research. ”Instead of heading a team entrusted with a probe of alleged war crimes and crimes against humanity by Syria, the general should be investigated by the ICC for evidence of similar crimes in Sudan,” Ismail said in a statement. The World’s Worst Human Rights Observer. “As Arab League monitors work to expose President Bashar al-Assad’s crackdown, the head of the mission is a Sudanese general accused of creating the fearsome ”janjaweed,” which was responsible for the worst atrocities during the Darfur genocide. But Dabi may be the unlikeliest leader of a humanitarian mission the world has ever seen. He is a staunch loyalist of Sudan‘s President Omar al-Bashir, who is wanted by the International Criminal Court for genocide and crimes against humanity for his government’s policies in Darfur. And Dabi’s own record in the restive Sudanese region, where he stands accused of presiding over the creation of the feared Arab militias known as the ”janjaweed,” is enough to make any human rights activist blanch. Dabi’s involvement in Darfur began in 1999, four years before the region would explode in the violence that Secretary of State Colin Powell labeled as ”genocide.” Darfur was descending into war between the Arab and Masalit communities — the same fault line that would widen into a bloodier interethnic war in a few years’ time. As the situation escalated out of control, Bashir sent Dabi to Darfur to restore order. Doesn’t this sound like the prefect qualifications for leading a mission observing human rights violations? ”Campaigners expressed alarm Wednesday after Arab League observers in Syriasaid they saw ”nothing frightening” during a visit to Homs, the city activists say is the epicenter of nine months of deadly clashes with government forces. ”Some places looked a bit of a mess but there was nothing frightening,” Sudanese General Mustafa al-Dabi, the chief of the monitoring contingent, told Reuters by telephone fromDamascus. ”The situation seemed reassuring so far,” he added after his team’s short visit to the city of one million people, Syria’s third largest. And these astute observations was done during the most brutal onslaught against Homs by the Assad forces. “An Arab League observer in unrest-swept Syria said Wednesday he has quit the mission, accusing the regime of committing a series of war crimes against its people and of duping his colleagues. ”I withdrew from the Arab observers mission because I found myself serving the regime, and not part of an independent observer group,” Anwar Malek told the Doha-based news channel Al-Jazeera. ”The mission was a farce and the observers have been fooled. The regime orchestrated it and fabricated most of what we saw to stop the Arab League from taking action against the regime,” Malek said. But an official at the Cairo-based Arab League dismissed Malek’s accusations, saying they were all unfounded because he was bedridden and was never in the field. ”He was ill and bedridden at his Syria hotel. So how could he make those claims?” said the unnamed official. The observer who said he spent 15 days in the flashpoint central city of Homs said it must be declared a ”disaster” zone. ”I saw charred and skinned bodies that had been tortured,” said Malek. In the interview, Malek said that there had been ”an assassination attempt on Monday as we were being taken by car from Homs to Damascus” via the restive Baba Amro district where the mission came under gunfire. Malek accused the Syrian regime of plotting the attack on the road ”controlled by the army and pro-regime ‘shabiha’ militiamen. Also on Monday, two Kuwaiti army officers in the observer mission were ”slightly hurt” in an attack by ”unidentified protesters,” the Gulf state’s defence ministry has reported. The observers were attacked while heading to the coastal city of Latakia, said the ministry. Aparently he was on another planet than the Sudanese general Mustafa al-Dabi. But of course he was just hallucinating in his hotelroom as the official at the Cairo-based Arab League HQ said when he dismissed Malek’s accusations, saying they were all unfounded because he was bedridden and was never in the field. The Arab League’s monitoring mission in Syria has been a miserable failure, and no international white knight is waiting in the wings. Syrians are on their own. ”In December, after months of stalling and facing enforced sanctions, the Syrian regime finally seemed to buckle under pressure from the Arab League and agreed to sign a ”protocol” ostensibly aimed at quelling the uprising. The agreement called for the regime to remove heavy artillery from urban areas, halt the use of force against civilians, release all political prisoners, and allow independent media into the country. Late last month, an advance team of 15 Arab League observers arrived in Syria on a one-month mission to monitor the regime’s compliance with the protocol. They have since increased to 153 observers; that number still falls far below the 500 observers that was part of the original agreement. ”Observe” is a banal word sucked of accountability, responsibility, action — a fitting way to describe an Arab League mission. Monitoring abuses of power is a function one would not expect from the Arab League, which, let’s face it, represents mostly dictatorships and absolute monarchies that have less-than-stellar human rights records. But observing Syria is an activity we have all become complicit in — observing the meetings, agreements, conferences, opposition groups forming and reforming, while Syrians are killed every day. These discussions, devoid of action, build a cruel barrier between ruthless international power games and innocent people who are being played. This is why the Syrian people suspiciously view the Arab League as a protector of the regime and by extension its brutality. The observers’ arrival changed the rules of the game. The regime sends spies to take pictures of the protesters who dare speak to the observers. Before every excursion, the streets are secured in any way necessary, by bullets or arrests (for the safety of the observers or to preserve what’s left of the regime’s tarnished image?). The streets of Deraa have to be scrubbed clean of its people, silencing their voices and erasing any sign of dissent, to present an image of control, safely guarded by snipers lurking on rooftops. So far, the regime has freed 3,500 prisoners, but an estimated 30,000 more still remain imprisoned, and according to Syrian activists, 5,700 people have been detained since the Arab League mission began. One week before the observers arrived, the regime escalated the crackdown, killing at least 250 people in four days. Since then, the casualties have gone down to an average of a couple of dozen people a day, according to numbers tallied by various human rights groups and local coordination committees. “One of the most important shifts in the revolution during the Arab League mission has been its coverage, not by the media but by citizen journalists. Protesters who have been filming demonstrations and atrocities for months have turned their lens to film the observers filming the regime’s atrocities. Their powerful YouTube clips feature the monitors in their bright orange vests surrounded by the sounds of gunfire, confronted with dead bodies of children, and bombarded by protesters’ complaints and grievances. 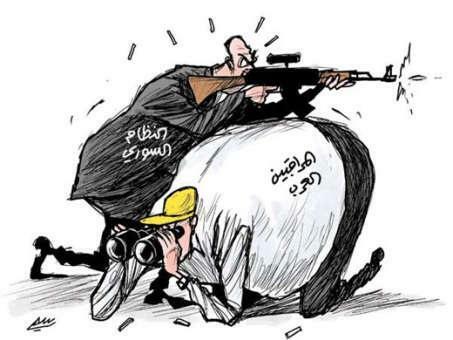 Observing the observers has emerged as the people’s powerful media weapon against the regime and its propaganda. “Human rights activists now fear the Arab League mission is turning into a farce, as shootings and killings take place almost under the observers’ noses in places like Homs, Hama and other trouble spots. “Local witnesses claim tanks had been removed from the streets just ahead of the mission’s arrival only to be hidden nearby, where they could supposedly be redeployed as soon as the monitors were gone. Soazig Dollet from the organisation Reporters Without Borders says the Syrian regime is simply exploiting the observers’ visit for its own ends. She also claims that Syrian authorities are engaged in an elaborate game to show the observers what they want to see. After having Assad making a mockery of the Arab League peace plan. And their observers mission in Syriaa total failure. The Arab League took the same peace plan to the UN Security Council only to be vetoed by the as always helpful Russians and Chinese. And to REALLY rub it in the Russians and Chinese even voted against a non-binding resolution by the UN General Assembly. So what did the humiliated Arab League do after that? Eehhh… they went to one of the powers behind their humiliation, Russia, and literally “begged” the Russian Foreign Minister Lavrov for ANY kind of a deal. So in the end the Arab League got a new, even more watered-down deal dictated to them by Russia, which then became the UN/Annan peace plan. And as a result got even more humiliated. Because when they tried (Qatar) to make some amends to the total sellout, as they well know, they were literally repriminded by Lavrov like naughty/misbehaving school children. Assad’s victory has therefore vindicated Putin and awarded Russia a political and military achievement on a scale that has eluded Moscow for many years. Putin proved he could win over an Arab country to Russian influence, shut doors to the Obama administration’s interference and wind up calling the shots in Damascus. The Russian Foreign Minister arrived in Caro Saturday, March 10, ready collect kudos.. It was strange to see Lavrov sitting in a place of honor at the 22-member Arab League foreign ministers’ meeting Saturday, March, 10. Stranger still, they let him talk the Arab ministers down and dictate Russia’s five-point plan for the Arab world to follow for resolving the Syrian crisis. It called for a complete cease-fire, monitoring procedures, no foreign interference, humanitarian aid supplies and “firm support” for international envoy Kofi Annan’s mission to promote dialogue between the government and opposition. 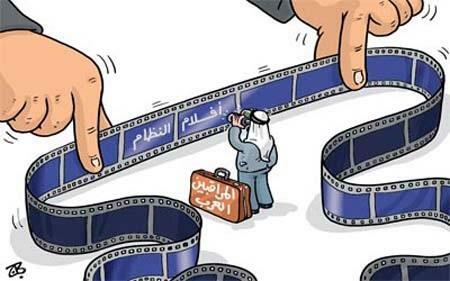 Aware of the true situation in Syria the Arab foreign ministers bowed to the Russian plan although it was clearly tilted in Assad’s favor. And when the Qatari prime minister and foreign minister Sheikh Hamad Jassim bin Jabr al-Thani tried later to undo some of the damage by demanding military intervention to stop the bloodletting in Syria after he had despaired of a Libyan-style Western-Arab operation, he was publicly rebuked from New York by Lavrov. Lavrov’s tone strikingly demonstrated Moscow’s utter confidence in its ability to dictate the course of events in the Arab world in contrast to Washington’s withdrawal from the scene. Not exactly one of the proudest moments in the Arab Leagues history. And as usual the ones paying the price the people of Syria.